Brilliant orange/red tubular flowers each with two spurs on the rear of the flower. They appear to be swarming around the green wiry stems that support them. 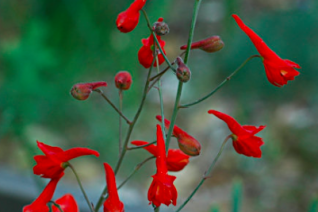 To 20″ tall, blooms rising from a basal rosette of leaves. Blooms May-July in Portland. Somewhat tricky southern Oregon native wildflowers that needs a bit of care and correct siting to establish and become perennial. Rich, well drained soil with light but consistent summer moisture. Native to very steep slopes and cliffs with excellent drainage but with groundwater in the form of seeps near by. Wild areas, gravel gardens for the ultimate wildflower effect. Established plants will often re-bloom if spent flower spikes are removed. Hummingbirds. Moderate deer resistance. Oregon native plant.